Precision Environmental Company is a recognized leader in safely and effectively removing asbestos-containing materials from all types of projects throughout the region and beyond. Our company management and field forces are trained and certified to complete asbestos projects in a multitude of states, and are familiar with all regulatory requirements mandated by the EPA and OSHA. Our company has an industrial construction background that is unique to the abatement industry. This professional skill set has helped Precision to develop creative and groundbreaking means and methods to get the job done effectively. Much of our asbestos work is performed in the midst of active facility operations or costly shutdowns. 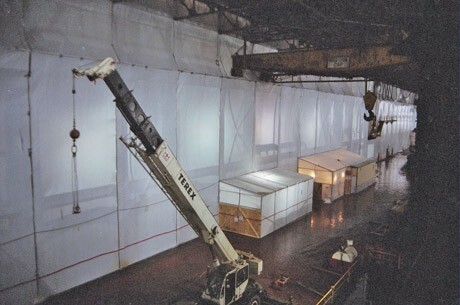 Containing and sealing off the work area and protecting building occupants and critical system components are performed with the utmost care for our customers’ safety and concerns. Precision specializes in projects with critical schedules and challenging scopes of work. With our highly trained management team, experienced field crews, and one of the largest resource distribution centers, we are prepared for any challenge. "As a Construction Manager at (GRC), I can always be assured that various tasks performed by Precision Environmental will be completed per specification, in a safe manner, within budget and on time. The professional attitude of the entire Precision Team and willingness to work with NASA as one Team is also to be commended. The Teams exceptional performance warrants special recognition. NASA Construction Management takes pleasure in commending the past years "Above & Beyond" performance of Precision Environmental."